⬅ Is Pathfinder too Adventure-centric? Sadly it seems we are destined never to see quite that many henchmen again! Of course, characters are a lot easier to run in 1st Edition than they are in Pathfinder/3.5 which is probably part of the reason for Leadership (that and the curse of balance). 1st edition was gloriously unbalanced so often the presence of henchmen spelled the difference between victory and defeat. Pathfinder is a much more balanced—or dare I say “fair” game—in which the challenges are normally carefully designed to fit the PCs. 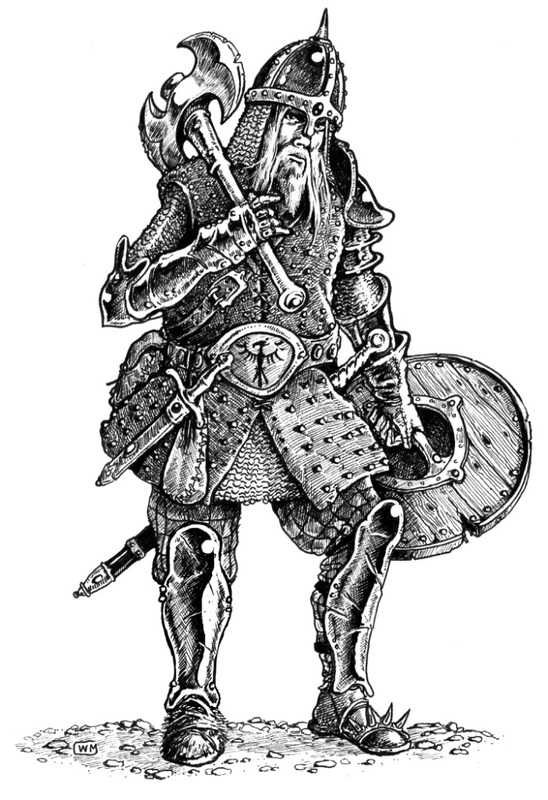 In 2012, Raging Swan Press released Henchfolk & Hirelings—my own take on hiring henchmen based on the notes in the 1st Edition Dungeon Master’s Guide. Excitingly, in my home campaign, when some of the PCs hit 3rd-level they hired henchmen using these very rules! This got me thinking of henchmen again and so I revisited the Dungeon Master’s Guide to see if I could find any more nuggets of information. So what did Gary have to say? I find Gary’s thoughts very interesting (mainly because I agree with them). Characters that rise in level enough to gain a stronghold or kingdom really, really need to have trusted associates to crush monstrous incursions and generally look after the fief while the master is off adventuring (or, of course, accompany their master on adventures). What I found particularly interesting, though, is that henchmen help to guard against the machinations of rival player characters! That suggests to me Gary’s campaigns were not all sweetness and light and that at least some PCs were probably evil (or at the least very, very selfish folk). Indeed, if you look in the original Rogue’s Gallery you’ll see several evil characters. I’ve allowed evil characters in my campaigns (sporadically) but thus far we’ve shied away from player on player action. It’s sounds like that at least some form of that was part of the very first campaign! Do you lament the disappearance of henchmen and hirelings from the game or could you care less? Let me know, in the comments below! How can I lament a disappearance that hasn’t happened? I run OD&D, my son runs OSRIC… the game is as awesome as it has ever been! I was thinking about this the other day. I prefer the 1st edition of handling henchmen. It was simple but it worked. Playing 5th edition now and I like the loyalty option that is offered. Gary’s early games frequently had players acting alone or in small groups, using henchmen and hirelings as padding. Imagine a mid-level wizard leading a group of 1st- and 2nd-level fighters and such through a dungeon. And while he didn’t necessarily encourage the players to act against each other, he did nothing whatsoever to stop them when they did. One example I remember reading was when one of the mages (Bombadil) placed a Magic Mouth spell on a massive stone face, to make it say that the person addressed needed to give their best possession to a neutral person (Bombadil just *happened* to be neutral). He then led another mage to the area, and conveniently placed himself out of earshot when the mouth spoke. Yes, indeed – in World of Greyhawk, the Bright Lands were where some formerly good adventurers had absconded to after a violent falling out among comrades. I don’t recall at the moment who remained on the side of good and law, and who left it, but there is a fine example of what you noted about fellow adventurers not always being sweetness and light in Gygax’s world, Creighton. It was Rary and he’s misunderstood I tell you! Misunderstood! Never been a fan of henchman. I would rather have a good player run two PCs to round out a party than have truly dependent henchman. However I agree that the most interesting line in the entire paragraph is “…machinations of rival player characters”. With a group of mature players, I have always enjoyed the tension/realism that PC rivalry brings to the table. Depending on your group, it is easy to cross the line here and it can ruin the game, but if played well I love it when party members don’t necessarily trust each other. This does not mean the game ends in a blood bath, just that there is tension and conflicting goals between party members and sometimes they can even come to non-lethal blows and very rarely well played lethal. Although I started in 1E, we never used many henchmen, I can recall one of PC’s Cavalier getting a kobold squire (long story), and a couple familiars. I can’t imagine a player with a PC, and either them or myself “running” 15 additional characters during an encounter. It is a challenge to keep combat moving fast in PF, even if players on paying attention to the initiative tracker and using good TTPs like rolling attack and damage dice together. I ran a druid with wolf companion and always rolled my d20+d8, and 2xd20+d6 for the wolf in one toss (all were color matched, and he had a trip attempt if his bite hit). On the other hand, familiars and companions are much more accessible in PF (as a specific class ability vs ask your GM to let you have a pet) so you can balance out a small party with more action economy w/o having a humanoid who should have a family etc. I prefer character development and would rather focus on my PCs than worry too much about henchmen. Its the same reason I shy away from NPCs embedded in the party. I’ll do it if required, but if it is purely an issue of action economy, I’d rather give a PC an animal companion (treating their class as = druid level) than be running the entire world plus 1/2 of the party. With Pathfinder’s Leadership feat we get “the mage I get with Leadership spends all his time making me magic items!” instead of rounded characters to help us. Of course, it depends on the player. Pathfinder’s insistence on “agency” and math probably embolden a certain type of player to do that kind of thing. And DMs are to blame for having henchmen turn against the party in crucial moments. “Oh, it turns out Bob the Hireling is really in the employ of the King of Assassins.” If DMs handled this sort of thing without resorting to “story-mode” it would go a long ways towards returning henchmen to their proper place. My players can use henchmen to run their baronies in the characters’ absence, because the henchmen are trusted (and trust the character). I refuse to use hack fiction tropes against my players. Plus, investigate any real-world adventuring party. There are dozens of porters/teamsters/men-at-arms to provide backup and secure the foothold. How interesting would it be if the players recruited a dozen men-at-arms to fortify a small clearing near the Caves of Chaos? If I ever play that module again, that’s what I’m going to do! I have never had a problem with NPCs or Hirelings, mostly because I homebrew many things on the spot and have groups that LOVE roleplay over stats. Our current game sees 32 minor NPCs working on the players ship, every time one is interacted with, He or She is assigned a name, and develop a background as the players take interest. One current hireling now has a full face, name, levels, etc because the party fell in love with her character. She is still just a lowly gunner, but she has character now. As such, This stress’ the party. They end up wanting to protect their friends and loved ones. So when a crew of 60 attacks, The players break up and start assigning some protection/support to the grunts, even at times buffing them over other players, and fight as if lives are at stake. They even have 4 “DMPCs” (Basically just player quality NPCs) That they can choose 1 of to take on each mission/dungeon while the other three hang back. They love learning about the backstories and quirks of everyone. In 1E, of course, it was a very different story. We were constantly acquiring henchmen and hirelings, partly because “status” demanded it, and more because it was necessary to the game at times. As has been mentioned hirelings and henchmen provided “padding” at lower levels and became the companions a character relied on at higher levels to either manage things or go out on adventures while the prime character managed things. When there were only 3 or 4 of us at a table including the DM 2-8 “spear carriers” let us take on more complex adventures. They were also the pool from which we drew should our main character die or be injured severely enough to have to rest and heal during a time when pausing the action was not viable. If it weren’t for the npc’s along you’d sit out, potentially for hours, while the game went on. They also served the vital functions of letting us explore other classes and options, unique “core” parties (the three wizards who embarked on a quest as a joint venture which made for a great story but if you’re metagaming the party is wholly unbalanced), and relieved boredom. As a low level magic user once your spell or two was gone you became the very weak pack animal hauling treasure and following the others safely behind the shield wall and doing very little. With an NPC or two you still got to do something. And if you’d been playing that cleric awhile and she was getting stale you might focus on the thief for a session or two for a change of pace. Now, most 5E games have a minimum of 4 players at the table, and each has a range of diverse abilities such that the diversity NPCs brought to the party isn’t necessary. Since damage heals quickly and outright character death has become rare, the replacement pool is no longer necessary. With balanced encounters the extra melee power isn’t necessary. There is a premium on cycling through the order quickly in combat and running more than one character slows that down. There’s also this attitude now that you’re cheating and stealing time from others if you have a follower or two. No matter how natural it is, more than once when I have had an NPC tagging along other players have complained that it gave me unfair advantage. In one campaign run by a more old school DM there were two NPCs hanging with my character and it worked well. They materially added to the story and the DM was clear that with my experience I was going to make decisions which broadened the story and advanced the adventure. We have been running a 1st Edition/2nd Edition/OSRIC AD&D campaign since 1980, generally about once a month. Currently our group is exploring a new (very old) area of the game world on a galleon outfitted especially for this. It is crewed by a bunch of NPCs, along with our main PCs, which we play as henchmen & hirelings. It allows us to run side missions with a band of the crew when our main characters are off on a mission elsewhere nearby. It gives us a break from our higher level PCs, our A team (14th to 10th level), every so often. We get to play lower level characters in less high level side adventures. I for one love it. We each have 4 to 6 crew members we are responsible for keeping track of & running whenever the opportunity (need?) arises. Our crew members vary in level from 9th level to zero level. So we can run B teams, C teams, even D teams on occasion. We have even had rare occasions when the ship has been attacked while the whole crew was on board! Occasionally a couple of our B team crew members travel with the main characters on some mission, as NPC henchmen/hirelings. It has allowed us to have a wide variety of adventures, with our ship (the New Horizon) as a comfortable mobile base camp. That sounds like a very cool campaign–I’m jealous! What do you mean disappearance? We still play B/X and henchmen are still vital!. No I know what you mean and a few of the people in our 5th Edition game are old timers and they still have a henchman but for the most part it’s gone out of style. Of course it would be tough in convention play to have a gaggle of henchmen accompanying the player characters and this has led to a different playing style for quite some time. And let’s face it modern characters are way more able to survive and prosper then many of the original classes. My world has Adventuring Companies. They are money making enterprises and Companies can and do find themselves in direct competition with each other. Henchmen and Hirelings also are directly involved with these conflicts which can include bar brawls, pranks, to murder and even extermination of competing Companies. Henchman and Hirelings are truly a necessity if PCs are true adventurers. Guards, cooks, armourers, fletchers, camp people, wagoneers, animal handlers, camp hunters, woodsman, bards, All make up the Adventuring Company. A lost artform. I love the idea of adventuring companies. In my own campaign, the players won’t even name their party! It’s one of my frustrations; I mean imagine a sports team or a band without a name! I like Gary’s final bit about henchmen adventuring when the OC cannot. Great way to have a change of pace and flesh out the world. I think a lot of the perceived need for Hirelings went away the the commodity status of magic items. My character can carry tons of supplies/good between my handy haversack and bag of holding. For 4500 gold my strength 6 level 4 character is carrying 370lbs of goods unencumbered. Throw in an efficient quiver at the next level and for 6300 gold I can carry another 60 arrows and 24 weapons. The weight for all 3 items – 17 lbs of weight to my character. That’s a great idea, Mike. I hadn’t thought of it that way. I am certainly against the commoditisation of magic items. I think it makes them far less wondrous (which is a real shame). Gary also said that the “rules” are not actual rules, but more guide lines. With that in mind, why not use whichever ” “rules” work best with your idea of how henchmen should work? Your campaign, your ideas, your hard work and time. Why should it be dominated by someone else’s rules? We are doing Hommlet (just finished) and moving on to the Temple. The party is playing 5e but we are using 1e rules. It’s great! They have Hirelings, Henchmen, and NPCs that tag along. It’s great to see the party fill up their ranks, but not always sure of the loyalty. Great stuff!